Since it was founded, Nevada City has attracted and inspired risk-takers, offbeat thinkers and non-conformists. From the rowdy and inventive miners of the 1860s to the off-grid hippies of the 1960s, this has been a place for the unconventional – and remains so to this day. Artists sense the freedom of thought here, and the intimate connections that creativity fosters in such a delightfully removed environment as the Sierra foothills. 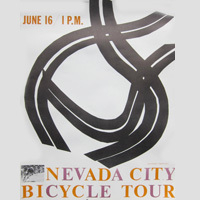 Osborn/Woods designed the poster for the first Father’s Day Bike Race, now known as the Nevada City Classic. Built in 1859 as a foundry and machine shop, the Miners Foundry became a performing arts venue after its sale in 1974 to San Francisco artists Charles Woods and David Osborn, who came to Nevada City when it was a burgeoning art scene. The Foundry has hosted Nevada City’s Roger Hodgson of Supertramp, Sacramento’s Cake, and the Red Hot Chili Peppers, playing secretly for Nevada City friends, associates, and their guests. Check here for coming events. Nevada City has been a home to many generations of writers. Perhaps the most renowned and enduring is Gary Snyder, who came here from the Bay Area after distinguishing himself, in Lawrence Ferlinghetti’s words, as “the Thoreau of the Beat Generation”. Having lived in a Mill Valley cabin with Jack Kerouac, Synder was the inspiration for the main character in The Dharma Bums. In the 1970s, he was active in the Sierra foothills back-to-the-land movement, and in 1974 published Turtle Island, for which he won a Pulitzer Prize. Harmony Books, at 231 Broad Street, carries Snyder’s work in a section for local poets (and a collection of works by other local writers in other genres). 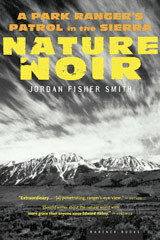 Another author influenced by the Sierra foothills is Jordan Fisher Smith, whose Nature Noir was an Audubon Editor’s Choice selection. Hailed by the New York Times as “eloquently meditative”, Nature Noir describes the author’s 14 years as a park ranger patrolling remote American River canyons east of Nevada City. A new author with roots, of sorts, in the Nevada City area is writer and actress Heather Donahue, author of Growgirl. The book chronicles Heather’s year living in “Nuggettown”, on a marijuana farm post in the Sierra foothills – and starting a new life after a flash of fame as the girl in The Blair Witch Project. Donahue has written for Los Angeles Magazine, The Huffington Post, Bust and as a columnist for Yahoo! Shine. She teaches personal writing in Nevada City, and has been a speaker at the local discussion and workshop series offered by Sierra Writers. A fictional look into the eccentricity of California’s hippie era is provided by Nevada City writer, Louis B. Jones, whose third novel, California’s Over, was named the LA Times’ 1997 Best Book of the Year. Each of Jones’s first three novels was named New York Times Notable Books. Described by novelist Amy Tan as “one of the best minds of our generation”, Jones co-directs the Fiction Program for the Community of Writers at Squaw Valley. (The Executive Director of the Squaw Valley Writers is Louis’s wife, Brett Hall Jones, daughter of famed novelist and Community co-founder Oakley Hall). 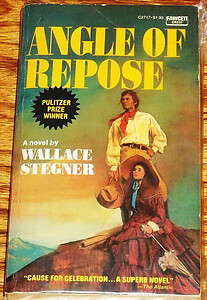 The most controversial book tied to the Sierra foothills literary community is Wallace Stegner’s 1971 Pulitzer-winning novel, Angle of Repose. The story is based upon the personal correspondence of author and illustrator Mary Hallock Foote (1847-1938), who lived near Nevada City for over 30 years and gained a national reputation as a skilled observer of life in early mining towns. Stegner used the outline of Foote’s life with conditional permission from her family, but objections later emerged over passages taken directly from her letters without providing specific credit. This controversy still haunts Stegner’s reputation, and is explored by author and director Sands Hall, a part-time Nevada City resident, in her comic/drama, Fair Use. Opening night at the Nevada Theatre dates back to the fall of 1865, and after thousands of performances with such headliners as Mark Twain, Emma Nevada, Jack London, Motley Crue and The Second City comedy troupe gracing its stage over hundreds of years, it has earned the distinction as California’s oldest original-use theater – and California Historic Landmark No. 863. 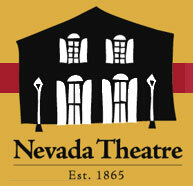 For upcoming events, visit the Nevada Theater online calendar, or subscribe to the Theater mailing list. 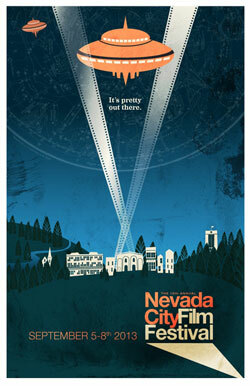 A recent (2001) addition to the Sierra foothills art scene is the Nevada City Film Festival (NCFF). Held late summer when warm evenings easily become late nights, NCFF inspires weekend visitors to leave sensible routines behind. Fiercely independent, NCFF promises the best short and full-length film, audiences, scenery and nightlife outside of Sundance and Telluride. Check here for this year’s Festival info. … And of course there’s more. Enjoy Nevada City’s tradition of environmental consciousness at The Wild & Scenic Film Festival, musical comedy at Off Broadstreet, and local musicians performing at Cooper’s, Crazy Horse Saloon, Haven Underground, and The Stonehouse.